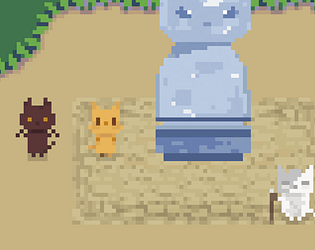 A puzzle-adventure game about exploration, kittens and lifting an evil curse! Really cute puzzler with some pretty classic, challenging levels. Crashes often on browser however, and it's not exactly breaking the mold although impressive! One of my favorite submissions! I tried the new glitch-free version. I couldn't finish the game though? It kept telling me a shrine was missing, but I could not find it. I did unlock the magic! It's almost a full game, that is what I found most impressive. There are four shrines in (roughly) the four corners of the map. In addition, there are four shrines fairly close to where you start: east, north, northwest (by the lake), and southwest (by the village) from the cat statue. Too bad the game freezes regularly, it has a really charming world! And it's a pleasant sokoban too. I'm amazed by the quantity of good content it offers. It's a very great work!